How do I import content from Moodle into Canvas? 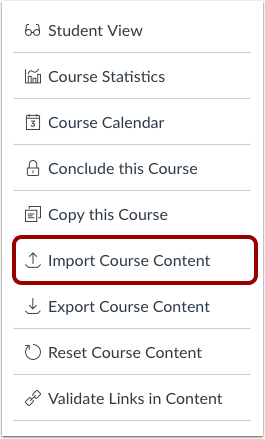 You can import prior content from Moodle exports into Canvas. Note: Moodle Lessons are not supported by Canvas import. 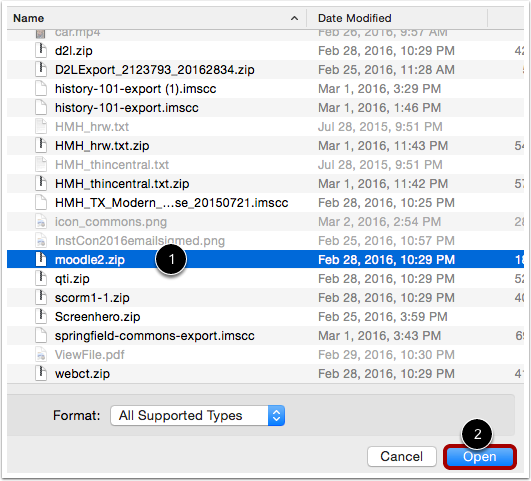 In the Content Type drop-down menu, select the Moodle 1.9/2.x .zip file option. Find and click the Moodle .zip or .mbz file you want to import . Click the Open button . 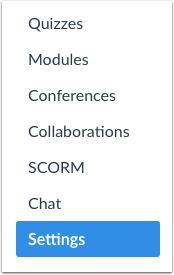 In the Default Question bank drop-down menu, select the Question bank you want to use for your question bank from Moodle. Previous Topic:How do I import content from Bb Vista/CE, WebCT 6+ into Canvas? Next Topic:How do I import content from Angel into Canvas? Table of Contents > Course Import Tool > How do I import content from Moodle into Canvas?